All Mana of Things – Page 14 – For the love of all things tabletop! Welcome to the wild west! 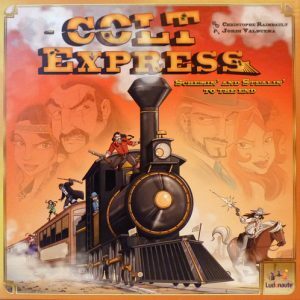 Colt Express is a western themed board game with a programming style mechanic and a cool 3D train. This episode is all about us and the podcast formats we host. We hope you enjoy it! We like to give you a little bit more in our podcast than just a review so for all review episodes we will be including a few audio grabs from movies and TV shows that match the theme of the game in case you want to end your board game night with a show and need some ideas. Of course this will be a little trickier with some of the more abstract games but we will do our best. (This episode is an example of a very abstract theme.) The audio clips will always be listed in the podcast show notes in case you don’t recognise them.